Produktinformationen "Korean Culture Series 10 - Traditional Performing Arts of Korea"
This book provides a comprehensive overview of the historical background, genres, and performers of the traditional performing arts of Korea, such as puppet plays, mask dramas, and Pansori, a uniquely Korean form of narrative song, which originated from the singing and dancing traditions of the ancient Korean people. 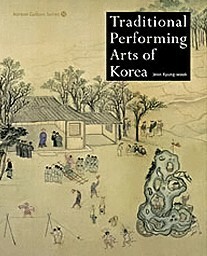 It offers a detailed introduction to a variety of Korea’s traditional performing arts. Weiterführende Links zu "Korean Culture Series 10 - Traditional Performing Arts of Korea"
Unser Kommentar zu "Korean Culture Series 10 - Traditional Performing Arts of Korea"
Kundenbewertungen für "Korean Culture Series 10 - Traditional Performing Arts of Korea"